I am a sophisticated dress that likes to play with subtle extravagances. This is the way I tune into my universe. I can express my moods as well as my emotions. 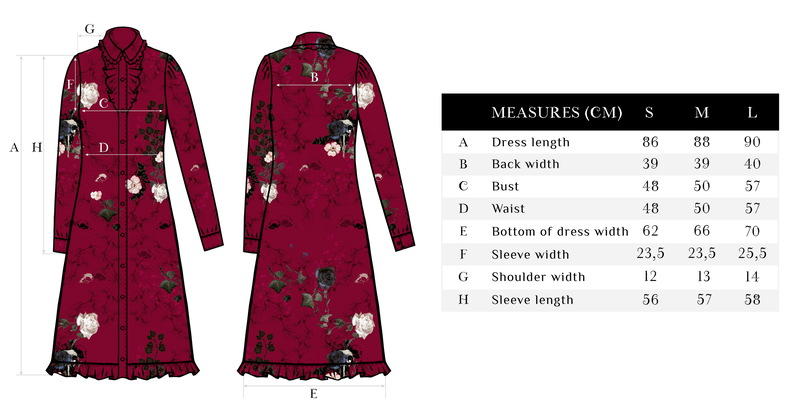 This print contrasts with the sensual blood red, the dominant colour of the dress. Cherry blossom and black and white roses are intermingled with ivy. The finesse of the natural elements clash with the outlined obscure crow skulls, emphasizing the Gothic influence. These, symbolize the ephemeral, the melancholy of the random nature of life, but above all the subtle borderline between dream and reality. The generous colour nuances give remarkable freedom of accessorization. A fluid silk glides over the body in a distinguished and suggestive way. Allied to this straight form, the dress follows the body with refinement and discretion. Made of luxurious, delicate Chinese silk, it gives the dress a unique drape. Due to the silk the shimmer of light is incomparable. The flounces shape the contours with elegance and create the unmistakable sophisticated draped effect. The shirt collar reveals a discreetly ruffled insert. These two elements are highlighted by a lining with a very high quality finish. The jewelled emerald coloured buttons give a sparkling and audacious touch to the ensemble. All the finishes of the "Crow Skulls" dress are handmade in accordance with the rules of the craft. The dress is of normal size. If you have any doubts, consult our size guide. The perfect Crow Skulls dress for parties and occasions. The dress is sufficient on its own, without artifice, for a delicate and distinguished look. At Keipsule we pay particular attention to creating items that can be easily accessorized while remaining original.